the life force energy that exists in everything and everyone. The word Reiki comes from the Japanese word (Rei) which means “Universal” and (Ki) which means “Life Force Energy”. Reiki is a gentle, yet powerful form of energy healing that helps prevent, diminish or heal negative energy patterns and emotions, which are often the source of many of our problems on all levels: mental, emotional, physical and/or spiritual. We have a lifetime of accumulated layers of blocked energy that arise for healing during treatment. Often, our symptoms and energy blocks are a result of emotional challenges and traumas stuck in our energetic and physical bodies. Repeated sessions are often necessary to dissolve blocked energy and heal issues on all levels, physical, mental, emotional and / or spiritual. You will find, as I did, a lift after a session, on all levels. A calmer, clearer energy into your days. Many cultures have employed this energy in various ways. Different cultures give it a different name, such as Chi in China and Prana in India, but it is all the same energy. For example, Feng Shui takes into consideration that the arrangements within a space or how a space is structured, can affect energy shifts throughout a space, which in turn affects people. To remove stagnant energy, and increase energy flow in an area is the function of feng shui. Similarly, Reiki is a way to dissolve blocked energy and create a more fluid, balanced and healthy energy flow within one's system. When our energy gets stuck, stagnate or low, maladies, diseases, and issues of all sorts can occur. 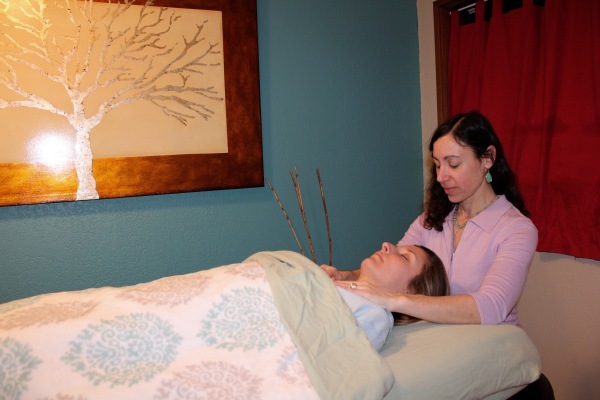 With regular Reiki treatments, expect to live a healthier and happier life. Do note, however, that Reiki is not a replacement for proper medical care and is not used to diagnose patients. It always works for your highest good. Reiki is an integrative healing tool in conjunction with medical care, as well as all other healing modalities. Reiki is often considered the missing link in health care. • It can lower blood pressure and improve heart rate variability. • It brings people to the alpha state where healing occurs most effectively. • It enhances memory and creativity. • It eliminates bodily toxins. • It relieves physical symptons of pain. • It restores depleted energy and speeds up recovery times. This is beneficial after surgeries, medical procedures, illnesses, injuries and deliveries. • It also provides comfort and peace to the terminally ill.
• You don't have to be sick or in pain to benefit from Reiki.